We are buying The Trolley Barn. The Trolley Barn, a beautiful and historic event venue, is located in our tree-lined neighborhood of Inman Park amongst restored Victorian mansions. Designed in 1880 with thoughtful awareness of its residential surroundings, The Trolley Barn is an architectural gem and a graceful reminder of the past that serves today as a unique site for your special event. 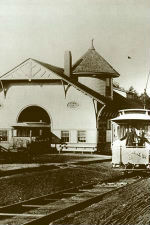 In August 1889, The Trolley Barn opened as the service and housing facility for Atlanta's first electric street railway line, running from the heart of Downtown Atlanta to Inman Park, which was at the time Atlanta's new garden suburb. Its life as a trolley barn was brief, however. With the development of trolley technology and the merging of various lines into a city-wide network, it became obsolete by the turn of the century. The following years saw The Barn used as a church, basketball court, farmers market, for various mercantile ventures and as a storage and repair facility for antiques. Over the middle decades of the 20th century, The Barn, along with its once lovely, but forgotten Victorian neighborhood, slid into decay and disrepair until it became ripe for condemnation in the early '70s. But prodded by urban pioneers in a reviving neighborhood, the City of Atlanta purchased the building in 1976 and, in conjunction with the newly-organized Atlanta & Edgewood Street Railway Company (AESRC), a name borrowed from the original 19th century company, began a restoration program, which was completed in 1987. The AESRC, comprised primarily of local residents, now manages the nonprofit rental facility. As of 2015, and after the Inman Park neighborhood banned together to fundraise for the facility, the city is selling The Trolley Barn to AESRC. Read more about the sale here.